It is set to be one of the major science projects of the 2030s. The European Space Agency has just given the green light to the LISA mission to detect gravitational waves. This will see lasers bounced between three identical satellites separated by 2.5 million km. By looking for tiny perturbations in these light beams, the trio hope to catch the warping of space-time that is generated by cataclysmic events such as the merger of gargantuan black holes. Ground-based laboratories in the US have recently begun detecting gravitational waves from coalescing objects that are 20-30 times the mass of our Sun. It should immeasurably advance our understanding of gravity and how it works; and perhaps even highlight some chinks in Einstein's so-far flawless equations. "We have no idea what we will discover, but perhaps we can get closer to the line that divides gravity from quantum physics. 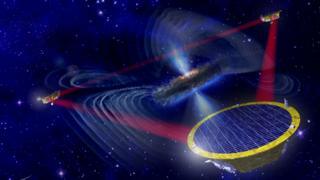 This may take us there," said Esa's director of science, Prof Alvaro Giménez Cañete. The agency's Science Programme Committee took the decision to select LISA as one of the agency's flagship missions at a meeting in Madrid. It paves the way for parallel industrial studies to consider the best way to build the mission. Once these have reported back and it is clear how Esa member states will divide up the various responsibilities for the satellites' development, the SPC can reconvene to formally "adopt" the project. It is at this point that the mission becomes real and the flight hardware begins to be fabricated. One of the outstanding questions that needs to be resolved soon is the role and contribution of international partners. There was a time when LISA was going to be a 50-50 endeavour between Europe and the US. Then, in 2011, the Americans walked away from the concept, citing financial worries. Europe continued with the feasibility work, even operating a demonstration spacecraft last year to test key technologies. But with the confirmation of the existence of gravitational waves made at the Advanced LIGO labs in Washington and Louisiana states, the Americans are understandably very keen to get back onboard. The earlier painful divorce had prompted Esa to put a 20% ceiling on any future international contribution, to avoid being left high and dry again. But Prof Giménez said there could be some flexibility on the issue, especially if it makes the mission more do-able. "The 20% is not so hard and fast; whether it's 15% or 30% is not important. What's important is that Esa leads," he told BBC News on a visit here to the Paris Air Show. "This is one of our Large-Class missions, one of our flagships. And you have to lead your flagships. The problem with 50-50 is that no-one leads, and nobody takes the responsibility needed to make sure things happen." Detecting gravitational waves is an astonishing technical feat. Even though these black hole mergers are extremely powerful, the ripples they induce in the fabric of space-time are fantastically small. The laser interferometers in the LISA satellites will need to be sensitive to a squeezing and stretching of their light beams on the order of just a few picometres. That's a few trillionths of a metre. And they must achieve this while the host spacecraft hold the formation of a triangle where each side is more than six times the Earth-Moon distance. Remarkably, Esa's demonstrator, known as LISA Pathfinder, proved the necessarily sensitivities could readily be accomplished. Tuesday's Science Programme Committee also formally adopted a planet-hunting telescope called PLATO. This was first selected in 2014, which gives an idea of how long it can take to step through the hoops of mission approval. PLATO is now set for launch in 2026. The earmarked launch date for LISA is 2034. Efforts will be made, though, to bring this forward because of the excitement that currently surrounds gravitational wave science. "It won't be much earlier - even if we had all the money in the world," Prof Giménez said. "It's a question of the technology readiness. It takes time to build a mission as complex as this. 2030 is the earliest we could do it, assuming we get the money we need and have no problems."